Viability assessment is essential for surgery and therapy planning following a myocardial infarction. In particular, the proportion of viable myocardium is a major factor in determining whether a patient may benefit from revascularization . In addition to estimating the left ventricular myocardial thickness and thickening using cine MR imaging, it is possible to visualize normal, ischemic and non-viable areas with high spatial resolution using late-enhancement MR imaging (LEMR). To locate and quantify non-viable tissue, the first step is the delineation of the endo- and epicardial contours on every slice (typically 10 to 20) of the LEMR short-axis acquisition, which is tedious and time-consuming when done manually. However, automatically performing this task is challenging  and, to our knowledge, not yet offered by any commercial product. This is mainly due to the non-homogeneous intensity of the myocardium resulting from contrast agent accumulation in infarcted areas. 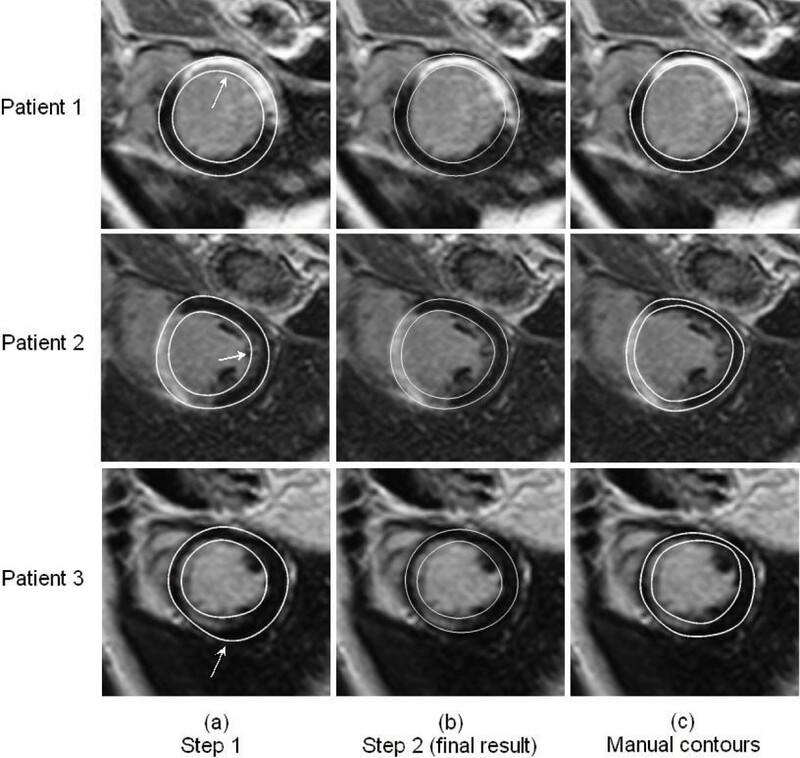 We propose a novel method to automatically delineate the endo- and epicardial contours in late-enhancement short-axis cardiac MR images in order to provide an automatic, accurate quantitative viability assessment. Our automatic segmentation method combines two techniques to find the myocardial contours. (1) First, in each slice of the late-enhancement data, a ring detection algorithm based on the Hankel transform is used to initialise the position of a 2D geometrical template modelling the myocardium. Its borders are then robustly deformed so that they fit the endo- and epicardial contours. This leads to a satisfying global result, but inaccuracies remain along the borders (see the arrows in Fig. 1(a)). We propose a method to automatically delineate myocardial contours in late-enhancement short-axis cardiac MR images, by using both 2D geometrical template deformation and 3D shape prior coming from cine acquisition, as a first step towards a fully automatic viability assessment. (2) The second technique consists in introducing prior knowledge concerning the left ventricle shape and thickness. To do so, we use the short-axis cine MR acquisition that is usually acquired during the same examination as the LEMR acquisition and identify the phase which best matches the late-enhancement acquisition time in the cardiac cycle. The myocardial contours can nowadays be easily automatically obtained on this cine phase . They are thus extracted and gathered to build a 3D mesh representing the left ventricle geometry and the underlying myocardium thickness. This mesh is registered towards the contours obtained at step (1), then locally adjusted using (i) the image grey values, to guarantee that scars are included inside the final myocardial contours, and (ii) a myocardium thickness constraint derived from the mesh geometry (see Fig. 1(b)). We quantitatively assessed the performance of the method on a database of 27 LEMR acquisitions (10 to 12 slices of 256 × 256 pixels, pixel size 1.5 mm) containing various types of abnormal tissues (large white transmural scars, sub-endocardial scars, scattered white areas...) by comparing the automatically segmented contours with manual delineations provided by experts (see Fig. 1(c)). The average error between the manual and automatic contours is 2.2 +/- 0.6 mm for the endocardium and 2.0 +/- 0.8 mm for the epicardium with a pixel size of 1.5 mm, which is close to intra- and inter-observer variability. Moreover, when removing 4 bad-quality acquisitions from the dataset, the results are respectively 2.0 +/- 0.4 mm and 1.9 +/- 0.7 mm for the endo- and epicardium. As shown in Fig. 1, the visual quality is good, the contours successfully surround both normal and abnormal parts of the myocardium, which allows a reliable assessment of the percentage of non-viable tissue. We presented an automatic, robust and time-saving method for the fully automatic delineation of the myocardium contours in LEMR images, which is an indispensable step in myocardial viability assessment.